State Department expresses concern over reports of chemical weapons attack in Idlib province. The State Department on Monday expressed concern over reports of yet another chemical weapons attack in Syria. 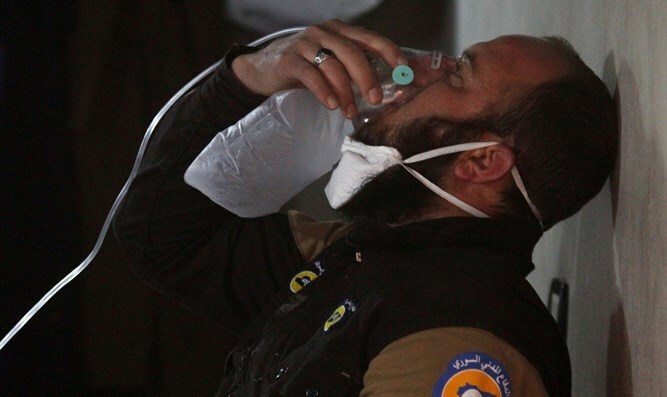 “The United States is gravely alarmed by continued allegations of the use of chlorine gas by the Syrian Regime to terrorize innocent civilians, this time in Idlib province near Saraqib,” said a statement from State Department spokeswoman Heather Nauert. “This attack is the sixth such reported instance in the past 30 days in Syria. We implore the international community to speak with one voice, taking every opportunity to publicly pressure the Assad regime, and its supporters, to cease its use of chemical weapons and hold those responsible accountable for these brutal attacks,” she added. Secretary of State Rex Tillerson “noted last month in Paris that Russia ultimately bears responsibility for the victims in East Ghouta and countless other Syrians targeted with chemical weapons since Russia became involved in Syria,” said Nauert. “By shielding the Syrian regime from accountability, Russia has not lived up to its commitments. The use of chemical weapons by all parties in Syria must unequivocally stop. The people of Syria are suffering; the rest of the world is watching,” she concluded. Arab media reported earlier on Monday that at least 20 people were killed in the suspected chemical weapons attack in Saraqib. Syrian human rights organizations told The Associated Press just before midnight Sunday that the rebel-held town in Syria’s Idlib province was subjected to a chemical weapons attack. President Donald Trump has not ruled out additional military action to deter attacks or punish Assad over chemical weapons attacks, administration officials said last Thursday, although they did not suggest any action was imminent. In April of 2017, Trump ordered an attack on a Syrian airbase after a chemical attack blamed on the Syrian regime in Khan Sheikhun.